Making an old space new. Audio Visual solutions for the 21st century. The original Royal Melbourne Institute of Technology (RMIT) building was built in 1844. Known today as ‘Storey Hall’, an upgrade was needed to make it ready for a new Vice Chancellor and being the best flexible future space. With a wide and varied history (including being a moonlight cinema! ), Storey Hall also has a wide and varied working life today. 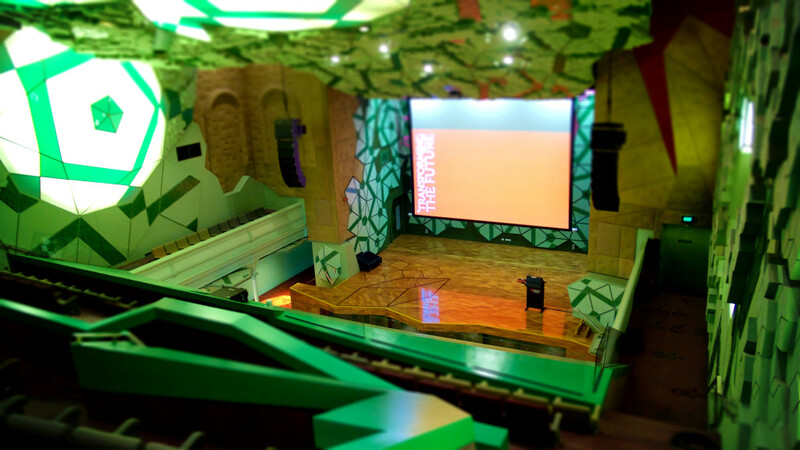 As a leading RMIT venue, it is a multi- functioning theater used for presentations, exhibitions, seminars, workshops and board meetings, and also for external performance’s both by RMIT’s performing arts sector and public usage. The existing system was unreliable. An urgent upgrade was needed. As a heritage-listed building there were special requirements with buildings, permits and logistics. RMIT called InSight Systems as their preferred audio visual consultants to provide a number of specialist audio visual solutions customised to the venue. InSight consulted collaboratively with RMIT and other suppliers, including builders and architects, for an appropriate av solution in order to maximize the use of this historic building space. Upgrades included a new audio visual system for the space to make it RMIT’s premier space. This required significant design solutions to work with the historical building and its acoustics. For example, a new Screen Technics 320” Admiral Bottom Roller Screen weighing 330kg had to be hung from the ceiling above the stage/presentation area. The solution required a coordinated effort between structural engineers, RMIT Property Services and InSight’s specialist av installation team to ensure that this screen was safely and securely fixed. This involved extensive scaffolding to be erected on the stage area whilst ensuring that there was no damage made to the stage surface. A second challenge that arose very early in the project was designing the right cable solution due to the length and path that the cable runs. The majority of connections run from the primary audio visual rack located at the front stage back to the bio box at the rear of the hall. A solution between using optical fibre and UTP cabling had to be made that would not impact the project cost while ensuring there was no compromise in signal strength and quality. After designing, measuring and testing solutions a collaborative decision was made to use Extron XTP system utilising UTP cabling as the preferred audio visual solution. Designing and executing successful solutions to these problems is testament to the care & detail that the InSight team go to to ensure that the client’s venues are left in immaculate condition. Additional ‘over and above’ InSight service was demonstrated with the work being conducted in a very short time frame during supplier blackout periods over the Christmas holidays. InSight’s experience in these unique spaces provided timely solutions without any issue for RMIT and ensured that the correct overall presentation and functioning of the Hall was achieved within deadlines. Interestingly, the space was designed and created for future expansion. RMIT’s future plan means the space will be incorporated in to future capital developments, hence the emphasis on flexible audio visual solutions and overall design. Technically Storey Hall houses an AMX interface control panel integrated into the lectern that was custom designed by InSight Systems design engineering team. The system also includes Extron AV switching in the back end and NEC 3 x 55 inch display panels for digital signage. The panels are housed in the foyer and hall entry of the building. Historical Storey Hall opened fresh and new, completed and available on time to hold the new Vice Chancellor’s introduction to RMIT and a University ready for future growth. The Storey Hall project is a great demonstration of InSight’s people experience providing a better world for RMIT. For more information on Storey Hall and it’s history, click here.